Château Brown has released the first batch of honey from hives installed near its vineyards in Pessac-Léognan. The eight hives, containing some 65,000 honey bees, are also meant to be an aid to pollination in the vines, as well as honey-makers. 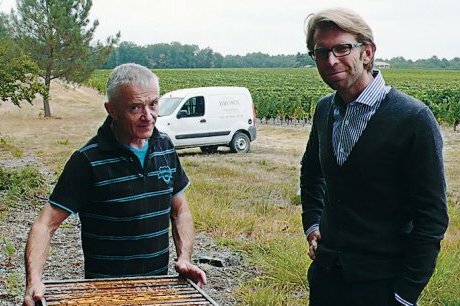 Château Brown’s director Jean-Christophe Mau told the drinks business that the bees were essential to all plants, even if vines are self-pollinating, as they help reduce the amount of insecticides used in the vineyard, which was crucial to the estate’s move towards lutte raisonnée. It was further reported in local paper Sud-Ouest, that Mau is thinking of increasing the number of hives “by three” next year. The bees are said to mostly feed on acacia flowers and the honey will be available from the estate as well as with a special wine tie-in the paper reported. db was lucky enough to taste the honey on a trip to Bordeaux last week and can vouch for how good it is on toast. Meanwhile, the Merlot harvest began at Château Brown today (9 October) as the 2012 harvest became one of the latest vintages in recent years. A cold winter and wet spring delayed flowering and made it very uneven, leading to harvesting dates that have varied wildly across the region. A lack of rain in the summer also led to water stress in some of the younger vines, Mau told db, although he added that the older vines had held up well. Many estates – including many of the first growths – started harvesting their red grapes as early as two weeks ago (the whites have already been picked). However, many châteaux including Mau’s property have been waiting. Mau added that it was a “good year for whites” however, which apparently have “good acidity like last year”. A full report on the progress of the 2012 vintage will appear tomorrow on thedrinksbusiness.com. Very pleased to read of the bee iniative . At Villa Saletta we have been doing a similar thing for the last 8 years where we have an ancient strain of Etruscan bee. Now actually have the hives inside old barrels stacked in the vineyards and they seem to do well on our various cover crops ( phacelia , erba medica etc) – only problem is to have a water source not to far away.